Illinois has hit a milestone it was not trying for. Numbers released by the Illinois State Board of Education in its annual school report card show that—for the first time ever—low-income children now outnumber middle-class students in the state’s public schools. It’s a trend that could affect everything from the state’s economic competitiveness to college-going rates to concerns over upward economic mobility in a time of increasing income inequality. Around 1.05 million kids qualified for free or reduced-price lunch during the 2013-14 school year. The percentage of Illinois students who qualify for a free or reduced-price lunch—long used by schools as a rough proxy for family income—has climbed steadily since 2000. In that year, 36.7 percent of Illinois public school students were considered low-income. Today, 51.5 percent are. In the 1999-2000 school year, 36.7 percent of Illinois public schoolchildren qualified for free or reduced-price lunch. Today, 51.5 percent qualify. All the increase has occurred in suburban and downstate school districts. According to federal guidelines, which are adjusted for cost-of-living increases each year, a family of four earning less than about $31,000 annually would qualify for a free lunch at school; kids whose parents earn less than $44,000 would get a reduced-price lunch. Illinois joins at least 17 other states in the dubious distinction of having a majority of its public school students considered low-income. Both Texas and California have topped 50 percent in recent years, and a majority of public school students are low-income across the entire South and West. Nationwide, the figure is 48 percent. Rebell says poor students need services—from before- and after-school opportunities to summer programs to health care and preschool—and all of it costs more. He says “irrational funding systems” for education in the U.S. mean affluent kids attend schools that spend more per pupil than schools serving poor kids. 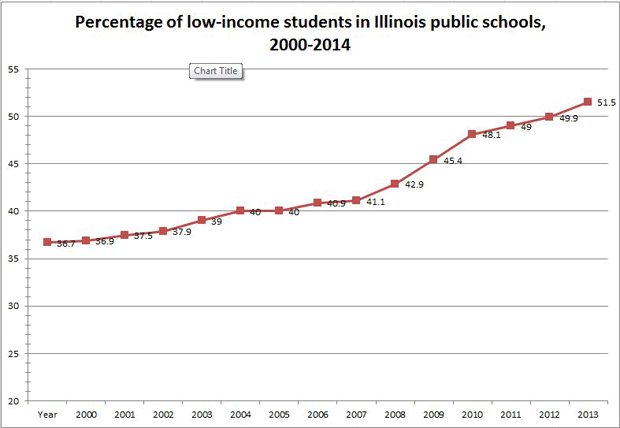 In Illinois, nearly all the increase in low-income students since 2000 has taken place outside Chicago. The percentage of students in Chicago Public Schools who are considered low-income has remained relatively stable since 2000, at about 86 percent. Two-thirds of the state’s low-income kids now live outside the city. In Community Consolidated School District 62 in Des Plaines, 57 percent of children in that 11-school district are now low-income— a 250 percent increase since 2000. “Every year we have been adding Title I schools. Even our schools that have typically been the more affluent schools in our neighborhoods are now also seeing that they qualify for Title I (federal poverty) funding,” says District 62 superintendent Jane Westerhold. Des Plaines schools have also become more Latino, another statewide trend. For the first time this year, white students dipped under 50 percent of the public school population as a whole. Westerhold says she believes that much more than students’ racial or ethnic backgrounds, it is poverty that is challenging schools. 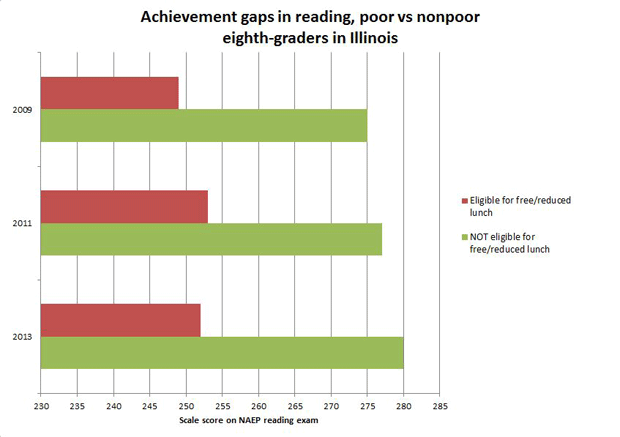 Advocates for low-income students believe states like Illinois must examine how well schools are doing with low-income kids. Daria Hall, the K-12 policy director at The Education Trust in Washington, D.C., says Illinois is behind the national average both in terms of how low-income students perform, and the rate at which they are improving. Michael Petrilli, president of the Thomas B. Fordham Institute, a conservative education policy think tank, says it’s possible that free and reduced-price lunch counts may be inflated (http://educationnext.org/fraud-in-the-lunchroom/). The lunch counts have risen faster than child poverty rates, and Petrilli notes they include both students living in poverty and children just above it. “Some of (this) almost certainly reflects what’s been happening under the recession. It also reflects that a growing number of our students are coming from immigrant families that tend to be much poorer than the families that were going to the public schools 10 or 20 or 30 years ago,” says Petrilli. Studies have shown that half of all higher income Americans have a college degree by age 25, while just 10 percent of low-income individuals do. “We have got to make sure that we have strategies for all the other kids as well,” says Petrilli. He says that includes vocational programs that put high school graduates in the workforce right away and allow them to “climb the ladder that way. That absolutely is still a good way to the middle class,” says Petrilli. Suitts says he worries about a society of the haves and the have-nots.